"Sampath Speaking" - the thoughts of an Insurer from Thiruvallikkeni: Egypt air hijacked ~ selfie syndorme !! Egypt air hijacked ~ selfie syndorme !! Ben Innes, currently living in Aberdeen, a Health and Safety auditor, is in news ! – moment of fame or infamy ? Most people know the phrase Stockholm Syndrome from the numerous high-profile kidnapping and hostage cases - usually involving women - in which it has been cited. The term is most associated with Patty Hearst, the Californian newspaper heiress who was kidnapped by revolutionary militants in 1974. She appeared to develop sympathy with her captors and joined them in a robbery. She was eventually caught and received a prison sentence. But Hearst's defence lawyer Bailey claimed that the 19-year-old had been brainwashed and was suffering from "Stockholm Syndrome" - a term that had been recently coined to explain the apparently irrational feelings of some captives for their captors. An Egypt Air jet was hijacked by man in bomb vest from Alexandria to Cairo – an unusual demand ?!?! - hijacker Seif El Din Mustafa demanded to see Cypriot ex-wife. The hijacker, identified as Seif Eldin Mustafa was seen wearing his 'suicide belt'. 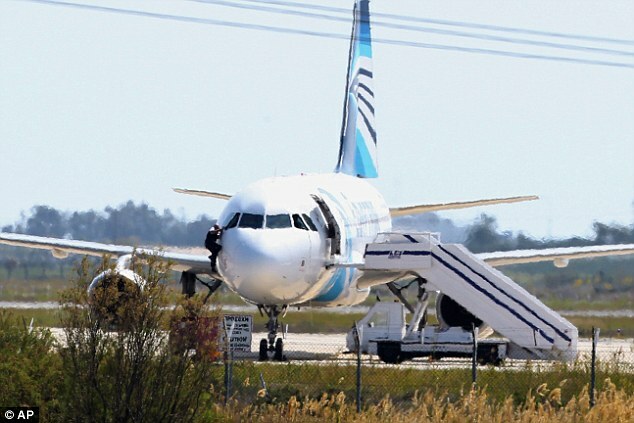 Mustafa hijacked the domestic Egypt Air jet after taking off from Alexandria and forced it to re-route to Cyprus' Larnaca airport, where he took several passengers and crew hostage and demanded to see his Cypriot ex-wife. The hostage situation on the tarmac came to a dramatic end just before 1pm as one of the pilots was seen struggling with someone inside cockpit before jumping out of a window, moments before authorities arrested Mustafa. The last remaining hostages, all non-Egyptian men, were seen running over the tarmac before the hijacker gave himself up. Mustafa disembarked the plane at around 14.40 local time with his hands up and threw some items on the ground, which were picked up by police and are being examined. Alexandros Zenon, Secretary of the Cypriot Foreign Ministry, did not immediately have more details on the arrest, but added that the hijacker appeared to be 'mentally unstable'. After the arrest, Cypriot authorities were able to determine that Mustafa's suicide belt had been a fake. Mustafa surrendered to security forces after a six-hour standoff on the tarmac at Larnaca airport. Cyprus police evacuated a stretch of beach near the tarmac, as at least four more people were allowed to leave the plane shortly after midday, with one man seen climbing out of the cockpit. EgyptAir MS181, carrying 62 people, including eight Brits and ten Americans, was en-route from Alexandria to Cairo when it was hijacked, forcing it to land on Cyprus. Even in that heat, a man took time and mind to take a selfie with the EgyptAir hijacker while being held hostage. The 26 year old was identified as Ben Innes, currently living in Aberdeen. Mr Innes, a Health and Safety auditor, was one of four 'foreigners' held hostage along members of the crew, during the six-hour standoff at Cyprus' Larnaca airport. He was one of the three last remaining hostages seen running across the tarmac in the moments before Mustafa disembarked the plane and surrendered to police just before 1pm Tuesday. Mr Innes is believed to have approached hijacker Mustafa while being held hostage on the tarmac, and sent it to one of his flatmates as well as other friends. 'I have no idea why he took the selfie but I imagine he probably volunteered to take it as he's no afraid to shy away from anything,' Mr Innes' flatmate Chris Tundogan told MailOnline. Strange are the ways of people. Puttingal temple tragedy ~ some insurance angle ! the 'Arunachala' Kiwi .... what ?